Many homes in Austin and Central Texas have to deal with foundation issues and the symptoms and effects of soil settling and movement. This is due mainly in part to the extensive presence of clayey soils that can shrink and swell as the moisture content in the soil changes. This soil is also referred to as expansive clay. The easiest way for me to describe expansive clay is to compare it to a sponge. During periods of rain and other moisture, this soil soaks up the moisture and expands, like a sponge does as it absorbs water. During periods where there is very little rain and moisture, the clayey soil does not retain the water and can contract, like a sponge does when you squeeze the water out. Now imagine a house sitting on top of this “sponge.” The expansive clay cannot move side to side, so it must expand up and contract down. This can cause a foundation to rise and sink with the addition or subtraction of moisture from the soil underneath it. The soil under a foundation does not all receives the same amount moisture does not all contain the same percentage and composition of clay. These problems, among others, cause different parts of a foundation to rise and sink at different rates and to different degrees. 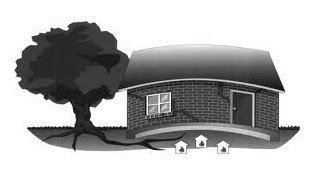 As a result, a foundation can tilt from side to side or experience deflection – the condition where the perimeter of a foundation is either higher or lower than a point in the middle. Disclaimer: I am not a licensed engineer and cannot offer advice on foundation issues or problems. For questions on your specific foundation, please consult an engineer. Most of the information presented here has been gleaned from the “Guidelines for the Evaluation and Repair of Residential Foundations” published by the Texas Section of the American Society of Civil Engineers. For the full report, Click Here. ← When Do I Have to Pay Back My First-Time Homebuyer Credit?